There's very little in the way of a backstory as to how I ended up interviewing Paul Grist. 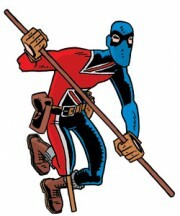 I was sitting around one afternoon reading a trade collection of his Jack Staff superhero comic when it struck me that they were entertaining and I should interview their creator. Cue the magic of the Internet and I was sending Grist questions 36 hours later. There is backstory to the cartoonist. Two decades plus. Perhaps best known to certain audiences as the illustrator of Grant Morrison's St. Swithin's Day, Grist became a professional cartoonist during a period when it looked like the UK might develop a bigger comics industry that looked sort of like the American version. 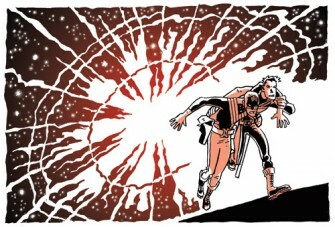 The closure of companies like Tundra UK drove the cartoonist to develop his own writing chops, and he resurfaced with the stylish Kane, a sometimes-whimsical and always stylish police procedural blessed with Grist's confidence use of black and white and willingness to toy with page design. 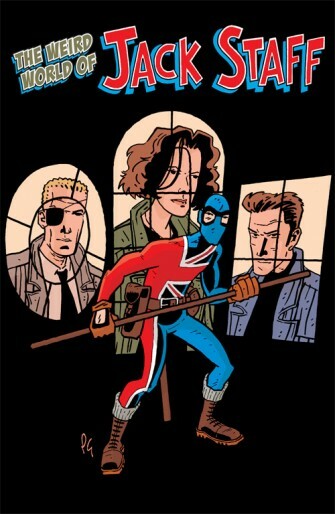 Jack Staff is a superhero comic told in incredibly short bursts of narrative, drawing on British kids comics archetypes and a sort of refracted take on American comics of its type. It's good-natured and droll and sometimes thrilling; once you get used to the art you realize that what Grist does with detail and figure drawing and attention to architecture is the kind of superhero plopped against a mundane background that a lot of people in that portion of comics only talk about. PAUL GRIST: Four years by my count, but that's still a lot longer than I realized! SPURGEON: Can I ask how successfully that move has gone in terms of giving Jack Staff a wider audience? GRIST: Although there was an initial boost the overall sales are not a great deal more than the black and white sales. It's my fault really for a sporadic publishing [schedule] which makes it difficult for the series to get any momentum with readers when they don't know how long they're going to have to wait to read the next part of the story. That said, I think I've learned my lesson and I'm trying to get things out on a more timely schedule at the moment. SPURGEON: What do you think your audience looks like? SPURGEON: I know that you have a message board, so there's some communication with fans that way. Are they Paul Grist fans of works like Kane that have drifted over, are they older superhero fans, or they Image fans in general? GRIST: All of the above -- I expect quite a few are just Kane readers who think I'm just wasting my time, really. I try not to think of my "audience." It's easier to concentrate on the story and tell that than try and worry about the "audience" and how they will respond to or interpret it. As I mentioned, having done a couple of different types of story, crime fiction with Kane and now superheroes with Jack Staff, both seem to have their own sets of fans both claiming that Kane/Jack Staff (delete as applicable) is my best work. Hopefully if you like one, then you should like the other. Doesn't always work like that though. Me? I'm a Burglar Bill fan. SPURGEON: In some ways, it seems like you were one of the first creators to join a re-focused Image. How do you feel about your company at the imprint now as opposed to when you started? Are there books at Image you consider peers to Jack Staff, or fellow travelers? GRIST: I think Image is a pretty exciting publisher -- it's the only publisher that seems to be actively encouraging submissions and if they think that a comic is good they'll get behind it and push. That said, Image did seem to be putting out a lot of titles with a "lets see what sticks" kind of attitude, which meant that some titles were released that only lasted a couple of issues before vanishing which then makes the Image "brand" look a little half baked, and retailers lose confidence in any titles put out by the publisher. I do think Image seems a bit more focused now and I'm certainly encouraged by the addition of something like Madman/Atomics to the line-up which came out around the same time as I originally started Jack Staff in 2000 as a self-published title, and I think has a similar attitude to what I'm trying to do. 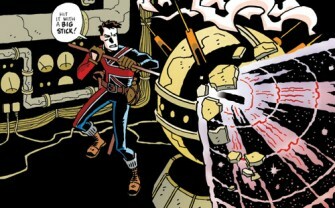 I can't imagine any titles less like the original Image Superhero Comic than Jack Staff and Madman! SPURGEON: I know that when you did the early publicity on Jack Staff, you talked about how the characters were informed by classic British characters as well as a few North American ones. As you've progressed with the series, does that kind of source material continue to inform your stories, or is that merely a function of character design? If your work continues to be informed by these sources, can you explain how so? If not, can you talk about how you develop characters in your series? GRIST: When I started on Jack Staff I thought it might be a bit of fun to include some reference to characters from the British comics I used to read, such as The Steel Claw (the Claw) and Robot Archie (Tom Tom the Robot Man). Not every character is based on another, though (some people try and pair them all up but it doesn't really work like that). Some of it is fairly superficial resemblance such as Tom Tom and the Claw, say, whilst other stuff is slightly more integral to the overall "big story" that I'm telling in Jack Staff, of which an example would be Helen Morgan and the shard of the Valiant stone that she wears around her neck which is a reference to Kelly's Eye. Tim Kelly was an adventurer who wore the Eye of Zoltec (I think -- I don't exactly research all this stuff -- I'm just running on childhood memory). That's one of the key story elements that I'm going to be exploring in the issues to come. SPURGEON: You're well known for your use of jump cuts, these abrupt stops and starts in your narrative, often switching scenes and scene-players entirely from one page to the next. Beyond bringing to mind boys magazines-type storytelling, what effect do you think you get by making such strong use of this narrative strategy? Does it give your work a special energy for instance, or a kind of narrative "noise"? GRIST: Mainly it seems to annoy people who expect to read a story starting with page one and then ending on page 22! To be honest, you could split the stories out and interweave them and have a more "traditional" comic structure, but I like the idea of everyone having their own little stories which interact with others. We're all heroes in own lives -- and this gives characters a chance to carve out their own storylines rather than being supporting characters for Jack Staff. In many ways, despite his name being on the cover, Jack Staff is the supporting character that links everybody else's stories together. SPURGEON: The profile of Paul Grist on the Read Yourself Raw page devoted to your work has maybe the nicest quote I've ever read from the late Alex Toth. How much of a direct influence was Toth, and can you talk about choosing to work more in his tradition as opposed to, say, [Jack] Kirby's? GRIST: I was very surprised to get my Alex Toth post card as it was totally unsolicited and very encouraging with his comments. Obviously he was just angling for some free comics, but it worked! But I have to confess Toth was never an influence, at least not directly. So there was never a conscious decision to follow a particular tradition rather than another. It's only recently that I've really begun to appreciate the dynamic of Kirby's work, which I never really got as a child as his work seemed crude and simplistic -- especially when compared to the work of artists such as Mike Noble or Frank Bellamy who I would read in the British weekly comics. SPURGEON: Is there an influence on your work you know is there that might surprise most people? Who, and where in your work would we see it? GRIST: A big influence on my work was a children's TV series called Press Gang, based round the adventures of a group of teenagers who put out a school newspaper (1989-94). It was written by a guy called Steven Moffat and did some amazing things with regard to non-linear story telling, jumping round in time and that kind of thing. It's certainly had a huge influence on my approach to story structure and the inclusion of girl reporters in Burglar Bill and Jack Staff! SPURGEON: Can you talk about how you approach character design -- do you sketch, for example? GRIST: I don't do a great deal of design stuff, a lot of it is instinctive get it down on the page kind of thing. The only character I remember doing much work on was Tom Tom the Robot Man. SPURGEON: Is there a design you think is particularly effective? GRIST: I like Sgt. States as a variation on the whole Stars and Stripes look, but I don't know how that works for an American eye. SPURGEON: How much are you conscious of your comics as a running commentary on the state of cities or communities? Certainly Castletown plays a major role in Jack Staff, if only for how events play out according to early events its history, or how the exigencies of community provide a kind of normalizing influence on the characters. Is that a subject that interests you? Your home city of Sheffield went through the classic late 20th century transformation out of industrial-based economies. GRIST: I do think that people's ideas and attitudes are coloured by the environment in which they live, and whilst Castletown in Jack Staff and New Eden in Kane are both fictional cities I wanted them to have a presence in the comics, so that they are recognizable to the reader. Whilst un-named in the comic, Sheffield is very much the setting for Burglar Bill and is the only comic where I've taken loads of photographs to use as reference for locations. Mind you that was some 18 years ago now -- a lot of the areas have now been the subject of regeneration and rebuilding projects so that the place is very different to how it was when I was growing up there! SPURGEON: Bramble and Son remind me of cartoonists, in their fealty to a not-always-appreciated craft, their crappy day jobs that might be even more humiliating and outdated, and their near-poverty. Was this intentional on your part at all? Because so many of your characters are defined in their title by their function or job, do you ever thinks in terms of vocational issues, or how we relate to our work? GRIST: I take your point, though you might be reading a bit too much into the characters there! Having said that, there are a few autobiographical lines in some of their arguments, so maybe you're not reaching too much. The name and job description style of character introduction "Becky Burdock -- Vampire Reporter" certainly hearkens back to the old British comics where you'd have characters like "Alf Tupper -- Tough of the Track." It does tend to be the first two questions asked when we meet new people -- what's your name, what do you do? SPURGEON: Has Alan Moore ever commented on your character Morlan the Mystic? SPURGEON: There's a coda in your latest collection where Jack Staff ruminates on if anyone will be there to mark his own passing -- is that kind of legacy issue, or the way in which the past so quickly become the past, something of interest to you? GRIST: We're all getting older. The point is that Jack Staff is a very long lived character, but he's not going to live for ever. SPURGEON: How long do you think you'll continue with Jack Staff? Do you consider these characters and this genre suited for open-ended exploration, or do you think there's a limited amount of stuff you'll have to say? GRIST: At the moment I'm just keeping things going. There is a big overall storyline in the background, so when that's done I think Jack Staff will have reached a natural end, but in the meantime there's plenty of foreground stories to tell, so I'm not going to commit myself to a set time frame! SPURGEON: As a fan of St. Swithin's Day, and your collaboration with Phil Elliott, is there any chance you'll return to that part of your career in the near future? It seems like with all the book deals out there that you might have attracted attention from those folks for your stripped-down, clear style that you've used in the past. GRIST: Book deals? There are book deals? The difference between those collaborations and the work I'm doing now is that those were working with a writer as opposed to writing and drawing my own stories. Whilst I wouldn't rule out working with Grant Morrison or Phil again at some point it certainly won't be in the near future. The art was done to meet the demands of those stories -- as well as I could do at the time. It's all a development of learning how to draw, to tell and pace a story. If I was to draw those stories now I think my approach may be different to how it was then. SPURGEON: How do you think your career might have gone differently if the attempts to create a more widely diverse comics market in your home country had been more successful? I know you were a part of at least Trident Comics.